All transactions are safe and secure with a reliable history in online purchasing behind each of our associates. 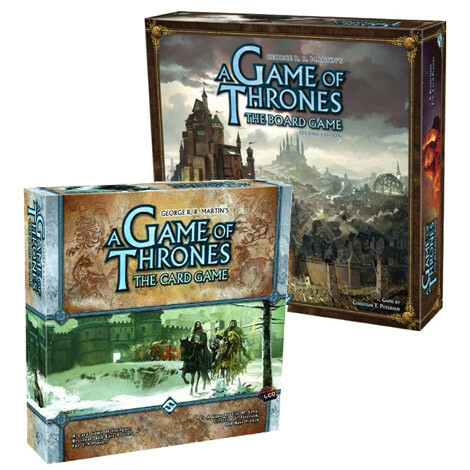 Buy the Game of Thrones Board Games, Card Games and Books to own Game of Thrones clothing and merchandise. Delve into the story by catching up on the A Song of Ice and Fire books by George R. R. Martin. Start off with the A Song of Ice and Fire Game of Thrones book, followed by A Clash of Kings, A Storm of Swords, A Feast for Crows and A Dance with Dragons. Heighten the experience by playing A Game of Thrones Card Games and the Battle of Westeros Board Games. Play with fellow fans or introduce first timers to George R. R. Martin's story that has been adapted into the HBO TV series. In addition to the Game of Thrones Board Games, Card Games and Books above, browse the Game of Thrones Clothing Gallery for more apparel like men's and women's clothes, kids shirts or hoodies.